First impression is of a sturdy, well-made optic that is very compact and very light for its focal length range. It still weighs in at 780g, not exactly light, but in context positively svelte compared to its f/2.8 alternatives. Carrying it for a full day in sweltering heat at 30C for a Run for Life event certainly reinforces the point. This is a full frame lens, but it can also be used on APS-C format camera bodies, where the equivalent focal length range becomes 112-320mm. Starting our tour of the lens, we have a generously sized bayonet fit lens hood, with a locking catch. Within the bayonet fitting on the lens, there is a conventional 72mm filter thread. Towards the front of the lens is a wide manual focus ring. This affords an excellent grip and is active during AF operation, so tweaks can be made to the final focus position. Focusing range is down to 1m, around 39.37 inches, a maximum magnification of 0.27x at 200mm. This is a very useful close focusing distance. Focusing is internal, and manual focus is not electronic so continues to work with the camera power switched off. Nonetheless, the action is very smooth and has just the right amount of damping. AF utilises a ring-type USM motor and is fast, accurate and silent. Behind this we have a small plastic window that houses the distance scale, marked in feet and metres. There are IR focus correction marks for 70mm and 100mm, but no depth of field scale. On the side of the lens at the same point are a series of switches. First is the AF limiter switch which offers a choice of full range or infinity down to 3m. The second is the AF on/off selector. The third is the optical stabiliser on/off. Advice is to switch this off when using a tripod. The fourth is the stabiliser mode switch. Position 1 is for static subjects, position 2 is for panning and position 3 is for irregular moving subjects. Closest to the camera body is the zoom control, clearly and accurately marked at 70, 100, 135 and 200mm. The action is smooth but firm enough so the focal length is not accidentally changed. Optical construction is 20 elements in 15 groups, two of which are UD (Ultra Low Dispersion) elements that approach the performance of fluorite but at a lower cost. This is further enhanced by the use of one fluorite glass element. There is a fluorine coating on the front element to repel dust and moisture, and the lens itself has a weather resistant construction. There are 9 aperture blades which should help to enhance the bokeh of the lens. Canon uses its SSC (Super Spectra Coating) technology to control ghosting and flare. 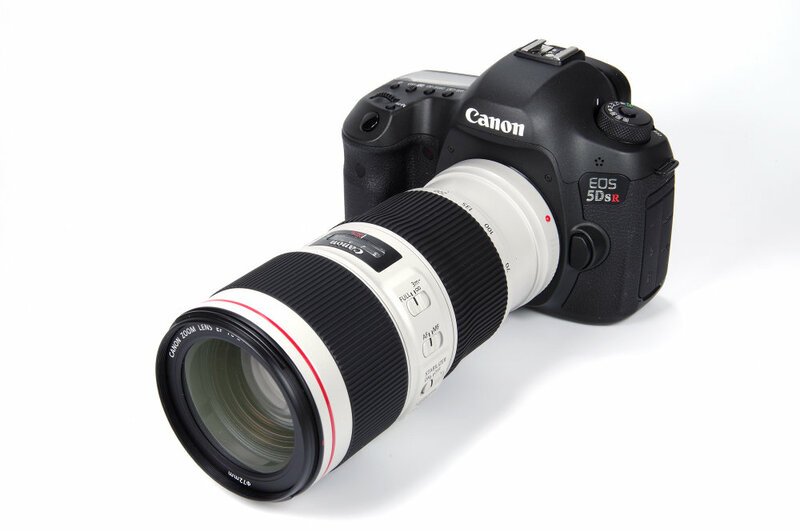 The lens is compatible with Canon's extension tubes and extenders (teleconverters). Extension tube EF 12 II offers a magnification range of 0.34x – 0.06x. Tub EF 25 II gives us 0.43x – 0.14x. There are two compatible extenders (teleconverters). 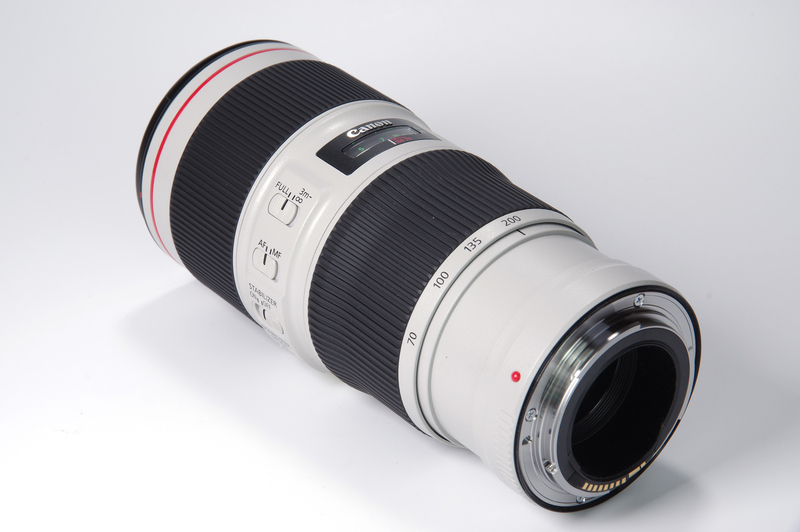 EF 1.4x III results in a 98-280mm range with a maximum magnification of 0.39x. The aperture range becomes f/5.6 – f/45. 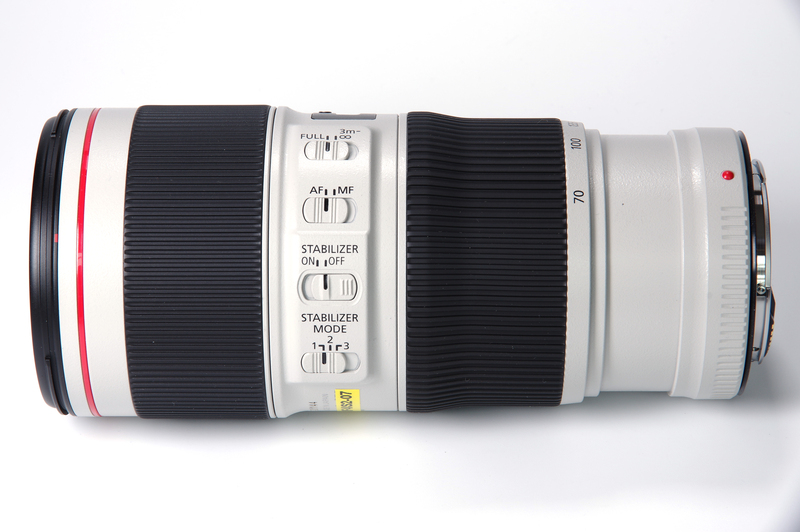 EF 2x III gives us 140-400mm with apertures from f/8 to f/64 and a maximum magnification of 0.59x. Both extenders (teleconverters) support AF operation, but for EF 2x III a camera body capable of supporting f/8 AF will be needed. In the field, the lens is superb ergonomically, operating flawlessly. The success rate with action shots is very high as the AF locks on efficiently. The stabiliser is also highly efficient, although as it takes a small but finite time to lock on it may be useful to sometimes switch it off. It obviously does nothing to reduce subject movement.